Pluto’s orbit is extremely eccentric, wildly off the ecliptic and sometimes closer to the Sun than Neptune, spending 14-31 years in a sign. It was discovered in 1930 at a time when fascism was ascendant in the world, when humanity gained awareness of fundamental atomic forces which if broken cause apocalyptic explosions. Accordingly, Pluto is a planet of extremes, making big things small and small things big. It’s also associated with tyranny and corruption, absolute control and absolute power, figuring into the charts of people who are movers and shakers in elite systems such as government, banking, corporate boardrooms. The condition of Pluto at the time of our birth shows what role we may play in our 14-31 year generation’s deconstruction and transformation in the topics of its sign and house placement. 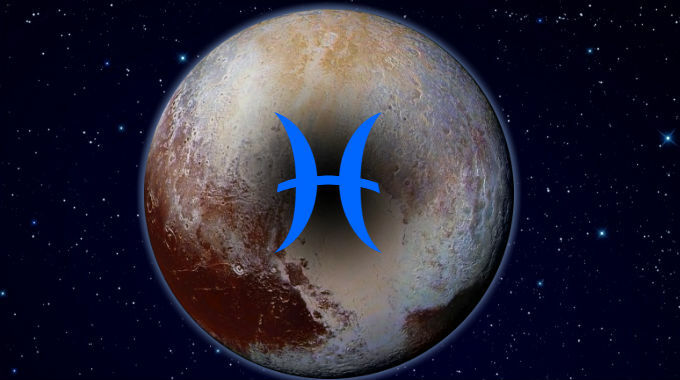 Pluto in Pisces is in a mutable water sign, empowering, warping, corrupting, deconstructing, transforming the topics of its ruler Jupiter, associated with spiritualism, inspiration, belief, visions, dreams. So Pluto in Pisces empowered, warped, distorted, corrupted, deconstructed and transformed these significations. People from this span of time may stand out as inspired and spiritual as a group. Individuals with aspects from Pluto to more personal planets and points may stand out as their transformational gurus, artists and dreamers. People also take on characteristics of the time they come from. Accordingly, the 1797-1823 Pluto in Pisces period transformed the resource of water with profound impacts, powering travel by rail and across the ocean through the first high-pressure steam engines appearing in this period. This time roughly corresponds with Napoleon’s rise and fall as he pursued the dream of France becoming a new Roman Empire, spreading liberal reforms wherever the Napoleonic Code was in effect. This was the beginning of the Romantic era, a reaction against the strict rationalism of the Enlightenment, embracing the Piscean boundlessness of free expression, unbridled emotion, solitary meditative connection with nature, myth, mystery and the supernatural. This was also when Beethoven began to lose his hearing and composed his most powerful and celebrated music, the soundtrack of the Romantic era. This is especially true if you were born with Pisces rising. Whether you experience the better or worse significations of this position depends on the kind of aspects it makes with the other planets.